Three weeks ago, my friend J and I spent four days in Seoul, Korea. We arrived at our hotel in the trendy Myeongdong district late in the evening (11pm), so we had to walk quite far to find a restaurant that was still open. On our way back to our hotel after dinner, the rain suddenly poured! 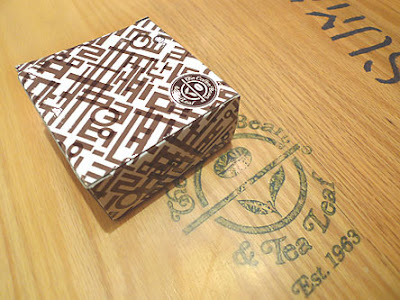 Naturally, we took shelter inside the only place that was still open at that time – a Coffee Bean & Tea Leaf cafe. 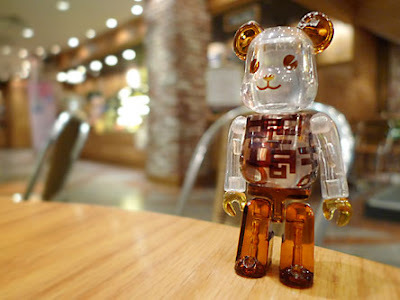 As we approached the counter to order anything that could legitimize our stay, J exclaimed, "Look, a Bearbrick!" Below was what he saw. This (below) was the box that it came in. All pics by yours truly. any thoughts on a Michael Jackson bear? 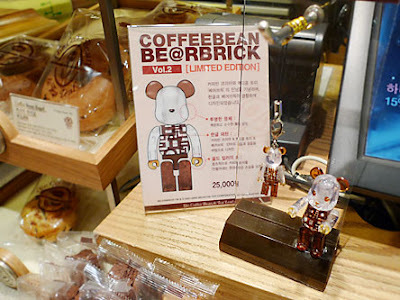 Btw, How many 100% bears do you have now?